Wesley Clark, Supreme Allied Commander NATO, testifies in this 2-minute video that the US planned to overthrow seven countries after 9/11: Iraq, Syria, Lebanon, Libya, Somalia, Sudan, and Iran. 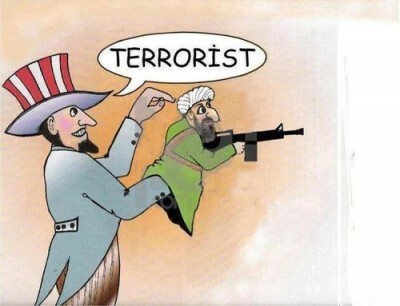 the US labels the reprisal “terrorism” to justify covert and overt military operations to overthrow targeted governments. Therefore, the US caused the “war on terror” as a policy choice; 9/11 was pretense and not the cause. Indeed, war law and two UN Security Council Resolutions provided international cooperation for factual discovery of the 9/11 terrorists, arrests, and trial for lawful justice all nations supported. The US rejects the rule of law, violates treaty obligations, killed over a million human beings from armed attacks since 9/11, and so far has long-term costs of $4 to $6 trillion to US taxpayers ($40 – $60,000 per household). This rogue state of the US ends when enough Americans in military, law enforcement, government, media, education, and the general public have sufficient intellectual integrity and moral courage to accept the “emperor has no clothes” obvious facts. 6. The CIA had several covert wars; perhaps most important in today’s context of war on Iran:“Operation Ajax” that overthrew Iran’s democracy and installed a US-friendly and brutal dictator. When that dictator was overthrown and Iran refused another, the US aided Iraq to unlawfully invade and attack Iran from 1980-1988; killing up to a million Iranians. If the US lied and acted twice to unlawfully overthrew Iran’s democracy within our own lifetimes, shouldn’t we assume first another lie-stared unlawful war today? Upon confirmation of the lies (documented below), shouldn’t we arrest the US War Criminals rather than allow them to kill again?!? 9. We now know from Congressional reports that all “reasons” for war with Iraq were known to be falseas they were told.